I have a 40 minute video on the recent media claims about the Batteriser, a device that claims up to 800% improvement in battery life with primary Alkaline batteries. The Neurologica blog came to same conclusion I did. Check it out. The Lygte Battery info site also has the same doubts and has test data to show remaining energy capacity. Check it out. As of course does almost every engineer on the EEVblog forum talking about this thing. The claims come from the Bateroo Batteriser website, and the PC World article, and the patent. Given the use of the word “too” for used batteries, this implies the main use they envisage is for use on new batteries. This is important as we’ll see. The big banner headline is up to 8 times or 800% increase in battery life, this is what the product is sold on, and what the media frenzy and headlines have been about. Notice on the website they claim “many” device stop working around 1.3V, this is very important to note. In their promo video they claim: “Every battery you’ve ever thrown away had only used up to 20% of it’s battery life” (my emphasis). In the case here of course “battery life” means “battery capacity”, the term we’ll be talking about here. And what’s with the “1.5V of energy” rubbish? Anyone who mistakes voltage for energy obviously has no clue what they are saying. How embarrassing for a company and product that is supposed to specialise in this stuff. Let’s look at the problems with the claims made here, as the 800% improvement in battery life is simply extraordinary to any experienced electronics design engineer. And as Carl Sagan said, extraordinary claims require extraordinary evidence. Can This thing Actually Work? Yes, of course. There is nothing new here at all, it is simply a boost converter circuit (not really a joule thief as many people are comparing it too) shrunken down to fit into a (very nifty looking) sleeve that slips around the battery. It boosts whatever battery voltage you have up to a constant 1.5V. It is important to note that the boost converter used here is used all the time in probably the majority modern electronic products. Any products that is even remotely well designed and works from batteries should have a boost converter and/or a low voltage battery cutout at a voltage that attempts to utilise the majority of the energy available in a battery. They are quite right in their broad claim, most batteries used in today’s products do not have the full amount of energy extracted from then, some energy is wasted and thrown away. How much energy is used from a battery in a given product is determined, essentially, from the “cutout” or “low battery” voltage level designed into the product. i.e. the voltage at which the product stops working or tells you to replace the battery. 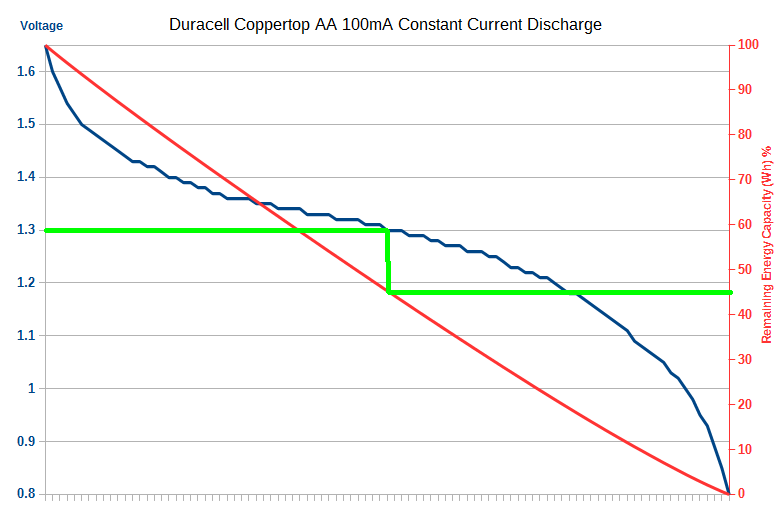 Here is a real example of this concept in a discharge graph from a real Duracell Coppertop AA Alkaline battery. The actual Wh energy remaining in percentage is on the right hand Y axis. 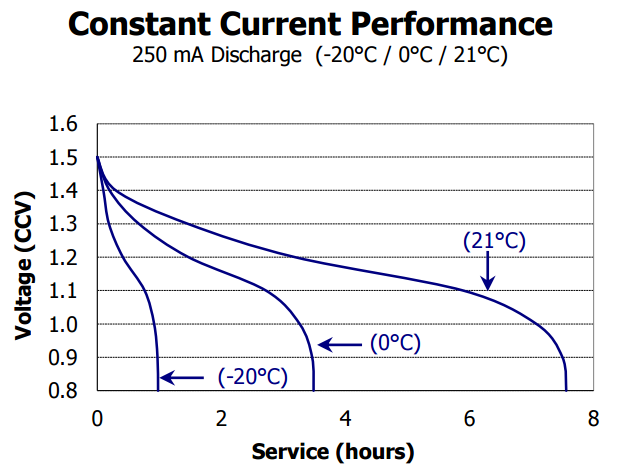 From this graph you can draw a direct line down from battery voltage cutout voltage to the remaining (wasted) capacity. The energy in a battery is effectively the area under the curve (integral) of the battery discharge voltage (blue curve). Note 1: There is a small amount of energy left under 0.8V, but it drops off very sharply and can be ignored for most purposes. This is industry standard practice. Note 2: This is the battery discharge voltage under load. This a critically important point. The measured voltage outside the product will not be the same. The interesting thing to note here is that for Batteroo’s claimed 1.3V cutout, around 45% of the energy remains (the green line). Not 80% as they claim. Why? That’s easy, this graph changes based on the load current, the higher the current, the more the cell ESR plays a role (more on this soon). But the shape and concept will remain. 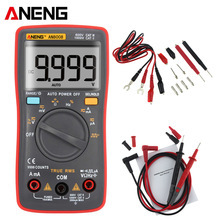 Now, at a certain higher current, depending upon the cell type, you will certainly reach a point were you will be wasting 80% of the capacity of the battery. But once again, they leave out this important detail! Indeed, in their promo video they claim every battery wastes 80%, and once again this is demonstrably untrue. On lower power products, like for example a wireless keyboard that they use as an example, it’s not going to be anywhere near the 80% energy lost they claim, it wouldn’t even be half that. So to get the 80% energy wastage they claim, they have to be talking about a high powered product, probably in the order of at least 250mA or more discharge. But this is at their claimed 1.3V dropout voltage, which as we’ll see below is demonstrably untrue, so I’m being overly generous here. This is not rocket science, this is battery 101 stuff to any electronics engineer! The energy in a battery is a product of power and time, not voltage! Units of battery capacity are defined in Watt-Hours (Wh). If it was measured or specified in voltage then a 1.5V D cell Alkaline battery would have the same energy capacity as a 1.5V AAA cell Alkaline. Even Joe Public can understand that a D cell battery holds a lot more energy than a AAA cell. 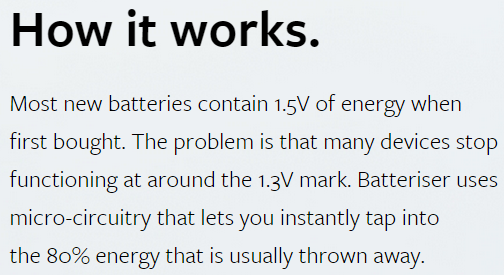 Saying “1.5V of Energy” is incredibly embarrassing for a company that is trying to market a product like this. Perhaps they are just trying to dumb it down for the masses? Products stop working at 1.3V ? This is the major claim being made by Batteroo, and the one that defines how the product works. So depending upon which quote you take from them “some”, “many”, or “every” (said in the promo video) products stops working when the battery voltage hits either 1.4V, 1.35V, or 1.3V, and hence the rest of the energy in the battery (available down to 0.8V) is wasted. So which one is it? From a battery discharge capacity point of view, 1.3V is a lot different from 1.35V, which is a lot different from 1.4V. They can’t even make up their minds on the typical dropout voltage they are working with. But lets give them the best chance possible, and use the number on their website, 1.3V. Is the claim true that “many”, “most” or “every” product stops working at 1.3V? No! This is demonstrably untrue, and you can easily test this yourself. Why is this so? Well it’s not surprising if you know about electronics product design. 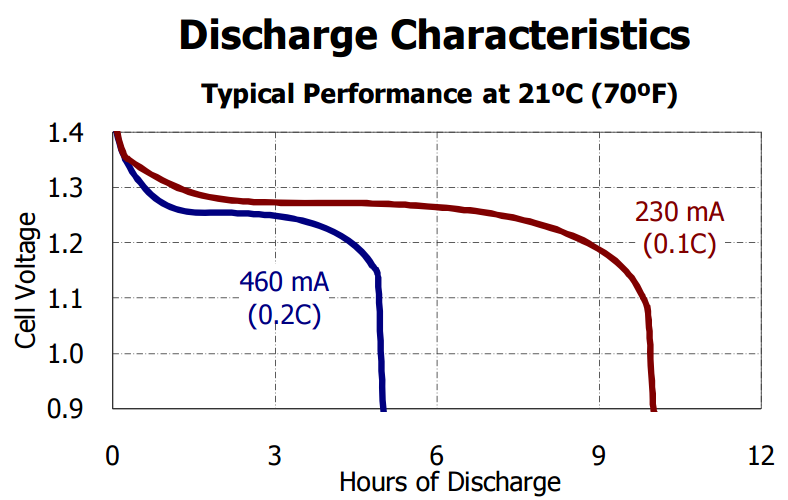 Not only do NiMH batteries start out out a lower voltage than Alkaline, but they have a flatter discharge curve for a longer period. This voltage changes of course based on the discharge current/power/temperature etc, but the shapes remain basically the same. This flatter an lower voltage period of NiMH’s means that products designed for use with NiMH rechargeables must operate a lower voltage than Alkaline. If you designed a product that dropped out at 1.3V as claimed by Batteroo, then it would only work for minutes or seconds with a NiMH battery. 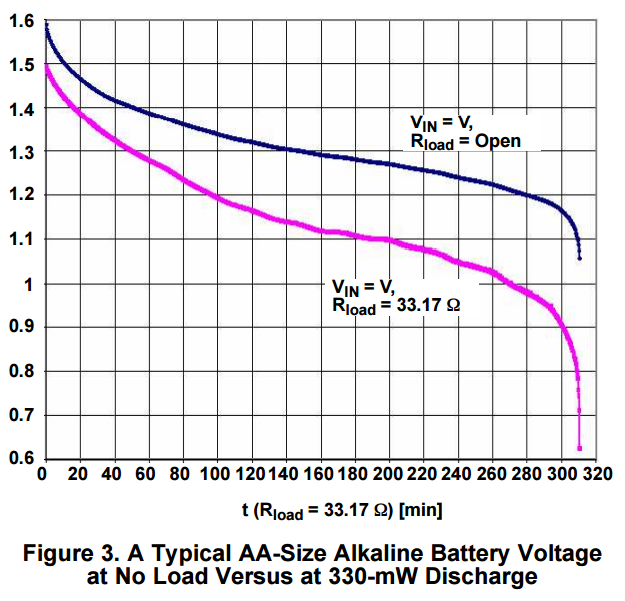 Now if you look at both curves you can see that any product designer worth their salt that wants to support both Alkaline and NiMH batteries, is going to design the product to have a cutoff voltage of about 1V, or 1.1V worst case. This means about 5-20% of the capacity of an Alkaline will be wasted, but having that cutoff voltage prevents NiMH batteries being damaged by being over discharged. This is why you saw in my test of a dozen products, a cutoff voltage of 1V is typical. If you were designing a product to only work with Alkaline, then you’d design it to work down the 0.8V if possible to use the most energy from the battery. This is all industry standard stuff that has been practiced since the dawn of battery powered products. Sure there might be a small percentage of really crap products out there with a very high cutoff voltage, but to base your entire product around this and market it like it apply to almost everything is just folly. So where did Batteroo, and the San Jose State university professor get this 1.3V cutoff figure from? I can only conclude that they are measuring the battery after it has been removed from the product. If this is the case then they are using the wrong technique for measuring battery voltage! Why? it’s obvious if you know what Equivalent Series Resistance (ESR) is. In simple terms, there will be some loss in the battery due to internal resistance. The higher the current, the greater the loss, in the actual internal cell voltage will drop before it gets to the terminals, it’s part of the battery chemistry. The product measuring the battery will be measuring the voltage under load and not open circuit like you would if you measured it once you removed it. Batteroo really need to clarify how they did this, it underpins their entire product and claims. In effect the battery voltage will always recover a bit after you remove it from the product due to the complex chemical ionic resistance in the battery. The higher powered the product the more open circuit (unloaded) voltage it will recover. But note that you aren’t gaining any extra capacity by doing this, it’s an illusion of capacity. 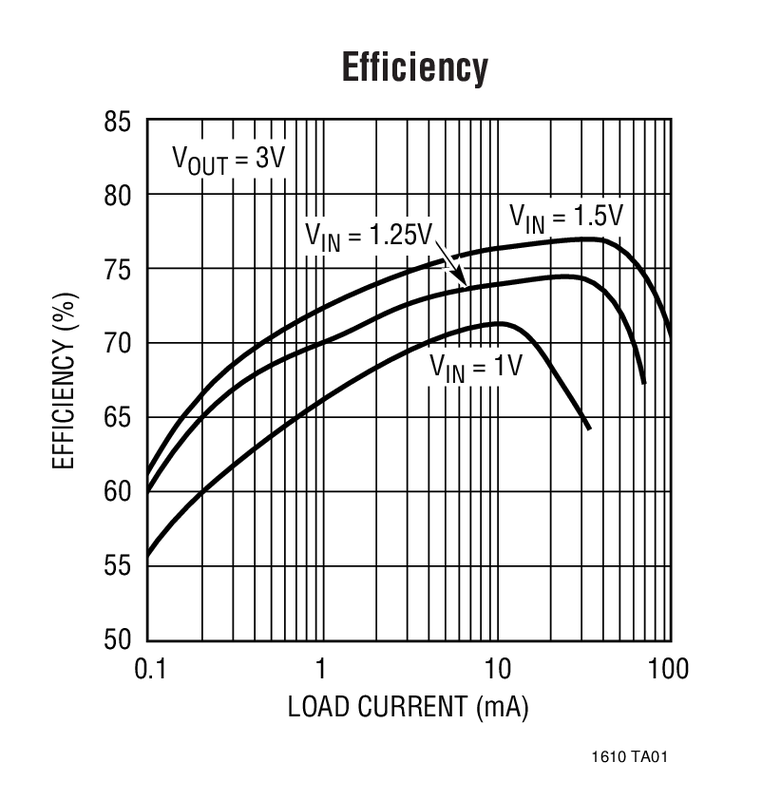 The only valid voltage measurement for cutoff voltage is one done under load in the product. That is how the the entire electronics industry does it. Once again, battery electronics 101 stuff. This graph shows the difference between measuring the voltage outside the product (open), or with the product load. UPDATE: Bateroo have since admitted (and shown in videos) that they do measure the battery voltage outside the product NOT under load! This is one of the most embarrassing technical mistakes I’ve ever seen in engineering, let alone from a company that specialises in this stuff, and has founders that have “decades” of industry experience. Make no mistake no one in the industry measures battery voltage not under load, due to the nature of the chemical ionic resistance in the battery. This is why all the battery datasheets gives you curves under load. Batteriser are the only ones silly enough to do this. So their entire premise and claims are based on a mistake in measurement that even young hobbyists know about. It’s double face palm worthy. One of the many things they don’t tell you, is that because it’s a boost converter, giving a constant 1.5V output for the entire life of the battery capacity, any battery gauge within any product will no longer work! Battery gauges work on the battery voltage, so your product will always show a 100% full battery until it suddenly stops working without warning. This is a big downside to such boost converter designs, perhaps a show-stopper for many people. And this is why no battery manufacturer will ever put such a thing in their batteries, it would render useless the battery gauge in every product. So they claim “up to” only 20% of the battery capacity is used, yet you can get an 8 times increase? That x8 increase is even in their logo! Something doesn’t add up here! If 20% is used as they tout then it’s a 4 times increase to get to 100%, not 8 times. To get the 8 times increase they claim you’d have to have only used 11.1% of your battery. Go on, try it on your calculator. BTW, an 800% increase is not x8, it’s x9! But given that x8 is used in the logo and website claims, and the articles say 800%, we’ll call them equivalent. Let’s say you buy a new battery. You use it for a month and its voltage drops to 1.4. It’s now ostensibly dead at 1.4 volts, but if you slip on a Batteriser, its output increases to 1.5 volts for another month. That’s already a 2x increase in battery life. Eventually the battery’s natural, unboosted output drops to 1.3 volts—but Batteriser keeps it at 1.5 volts for another month. Now you’ve realized a 3x increase in battery life. And so on, and so on. Roohparvar says Batteriser can continue to deliver a 1.5 volt charge in batteries that have discharged down to 0.6 volts. There are more than eight 0.1 volt steps between 0.6 and 1.5 volts, so, in grossly simplified terms, the Batteriser can extend operational battery life somewhere around a factor of eight. Grossly simplified? Are you kidding me, it’s demonstrably wrong to simply add 0.1V sets like that. Not only does it not take into account the characteristic curve shape, it doesn’t take into account the rising ESR, or the efficiency of their Batteriser, or any potential increased consumption due to the constant full 1.5V output. Look at my real example graph above for a product that draws 100mA constant current. Only 45% capacity is wasted. Right there not even a x2 increase in life. Subtract at least 10% efficiency loss (generous), and you are further behind. An 8 times increase claim is off in fairly land for any practical product. Also, have they demonstrated an actual 8 times increase in any product? It seems not, there is zero evidence. So much for the extraordinary evidence for their extraordinary claim. They don’t state their maximum output current, nor any efficiency curve for their DC-DC converter. Look at any efficiency curve for any DC-DC converter and there is always some sweet spot range of current it works over. Too small a current and the efficiency drops. Too high a current and the efficiency drops. Efficiency also drops with the battery voltage. Efficiency limits your maximum output pulse current, your power dissipation (the Batterisier is tiny=not much heat dissipation), and how much increase in battery life you can get. If your product can get double the life with the Batteriser (possible), but it’s efficiency is only 50% at that current, then you don’t get any increase at all. It’s useless. They mention their own tech in the DC-DC converter, ok, they could have something really novel here, and I’m really quite interested to take a look at it and measure it. But I can’t see them producing magic here. If they did they’d be using that tech to sell killer DC-DC converter chips in their billions for use in products. Remember most modern electronic products have these DC-DC converters built in. The negative terminal of the Batteriser is connected to the metal strip that goes all the way along the battery. Most Alkalaine batteries (I’e checked Energiser, Duracell, Varta, and Maxell) have the metal body of the battery connected to the positive terminal. The only thing preventing shorting out your battery is the plastic sleeve around the battery. This has to be a potential accident waiting to happen. They mentions use with rechargeables in their patent, but not on their website, and rightly so. To use the Batteriser with rechargeables could very well damage them due to excess discharge down the 0.6V. Any well designed product will cutout around 1V with rechargeables for this reason. I hope they ship a warning with the product, otherwise there could be a lot of unhappy customers with dead rechargeables. Many people will argue that the Batterier is only designed for use on “dead” batteries. i.e. you only put the Batteriser on once your batteries are deemed to be “dead” in your product. And then bingo, it brings them back to life and you get extra capacity out of an otherwise dead battery. This is not the main usage scenario claimed on their website, they imply it’s main use is on new batteries. You have no clue how much extra life you’ll get because of the battery gauge issue. As demonstrated, a majority of modern products already drop out at around 1V. Take my 100mA graph above, how much capacity is wasted at 1V dropout? about 5% of the battery! What’s the point extracting an extra 5%? or even 10% or 20%? Why carry this thing around instead of a new battery? Don’t forget to subtract the efficiency! I don’t get it, what’s the point?, please, someone enlighten me. Ok, perhaps you can find a badly designed product that give you maybe double the life, perhaps 3 times, and if so, that’s great, buy one, use it, be happy. But good luck finding that product. It could reduce your battery life! They won’t tell you this of course, but if you go by what they imply on their website and you use the Batteriser on new batteries, and you take my example graph above of a 100mA drain on a standard Duracell Coppertop battery, the Batteriser would have to 95% efficient just to break even! Of course it won’t be 95% efficient, almost no DC-DC converter is. It’s likely to be 90% at best, maybe 80% on average, and much less at lower or higher current extremes. With an average battery dropout voltage of 1V on products, that doesn’t leave many products with which to get any advantage at all on using new batteries. As I said above, the best case usage scenario is on old “dead” batteries, then you start getting gains right from the get-go. Here it can be a valuable product and has some value. What about high start-up loads? Many products require large initial start-up currents, often called in-rush current. Products that use motors for instance might have this requirement. Failure of the battery to provide this current due an increase in internal ionic resistance might fail to start the product. At this point someone might be tempted to use the Batteriser because the battery might have a fair amount of energy left in it, but it’s likely that the Batteriser (or any other boost converter) won’t work in this in scenario because it would require more start-up current from the battery than it did without the Batteriser. The ionic resistance of the battery of course won’t magically improve because it has a boost converter on it. It’s more likely than not to simply not worth either. I’m genuinely baffled as to why Batteroo would need to resort to claims like 8 times life. This thing would still sell like hot cakes if they claimed realistic practical figures. 50% increase in your battery life? – great, countless people would still buy it at the super low price point it’s at. You watch their Indiegogo campaign go gangbusters. I would welcome Batteroo to send in some devices for testing, and/or to publish their efficiency and performance curves, because from a packaging technology point of view it seems they have something really novel technology here, and I’m keen to see it. But please, lay off the marketing joy juice! As always, I’m happy to be corrected and proven wrong, and the community would appreciate if Batteroo can reply answering the obvious questions raised. Engineers are easy to convince, just show us the data! HERE is some great research on used batteries. About 33% is wasted based on their data. Perhaps Batteroo would be kind enough to publish their results to show their 80% claim? I’ll keep adding updates here as they come to hand so people can understand what they are buying. Since I have posted this blog article, Batteriser have made several (back peddling!) changes to their claims. This is a massive change! From confidently claiming that all batteries waste 80% of their energy only a paltry significant number of them waste 80% of their energy. So now that they have admitted 1.1V under load it is trivial for anyone to look at any battery datasheet and see how much energy is left under 1.1V for any load current. Of course the inconvenient answer makes their product now very useful at all in most products. They have admitted that their entire product and testing methodology (and by extension their patent etc) is all based on the measuring the battery terminal voltage with no load! This is an incredible oversight, and so wrong it’s embarrassing. 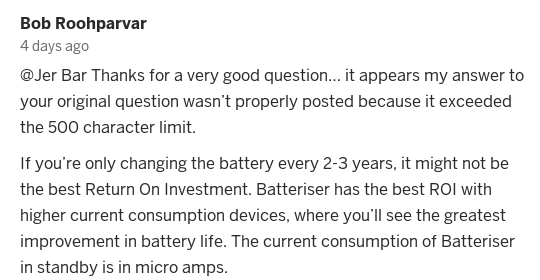 3) In thier Indiegogo campaign they have now admitted that the Batteriser is basically useless (the marketing buzz word is poor ROI of course) on devices that have low current consumption. Well, hello, McFly! Of course it is. But didn’t they mention things just like this like wireless keyboards and remote controls in all their advertising material? Yep, they did. Oh my, how embarrassing. 4) EEVBlog forum user LabSpokane has done proper testing on the same Apple wireless keyboard used in Batterisers marketing, and has found that the dropout voltage is 1.025V per cell, with about 8% capacity remaining in the battery, not the 80% claimed by Batteriser. Batteriser are out by an order of magnitude! 5) Fellow video blogger and EEVblog forum user TechnologyCatalyst has completely and thoroughly debunked the GPS test Batteriser used to prove they got extra. There is also more detail info and graphs and measurements on the EEVBlog forum. 6) The Sydney Morning Herald has published an article quoting various Australian university power experts who are all in agreement that claims the Batteriser cannot hold up. Batteriser also slander me by claiming I’m paid by Duracell! 7) There has been a paid targeted DISLIKE campaign against my and other video bloggers Batetriser related videos. 8) Gizmodo don’t like it either, and don’t pull any punches.